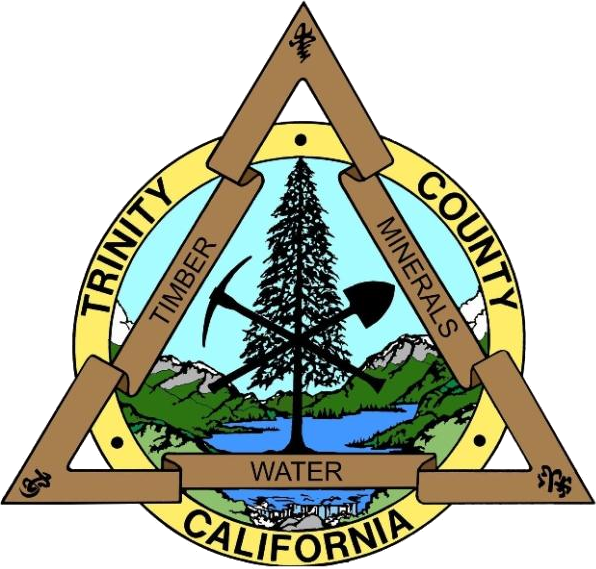 All residents of Trinity County are encouraged to sign up to receive CodeRED messages of their choosing: i.e. email, text and phone (landline and cell). All information is treated for official use only, to be used only as a means for disseminating emergency information. CodeRED allows time-sensitive, emergency information to be sent to specified locations via home phone, cell phone or email. 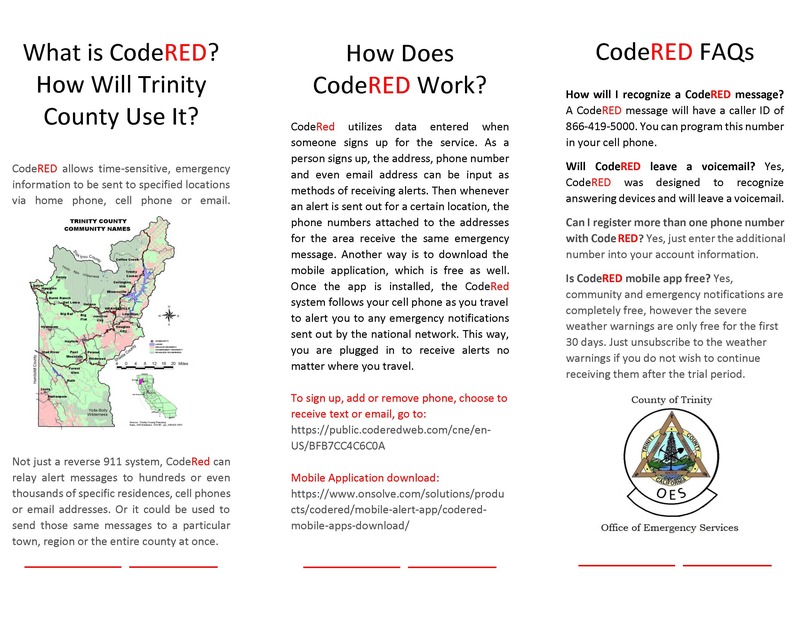 Not just a reverse 911 system, CodeRED can relay alert messages to hundreds or even thousands of specific residences, cell phones or email addresses. Or it could be used to send those same messages to a particular town, region or the entire county at once. Signing up on the website allows residents to enter their home address and receive notifications via phone, text message, or email that are specific to that address. CodeRED utilizes data entered when someone signs up for the service. As a person signs up, the address, phone number and even email address can be input as methods of receiving alerts. Then whenever an alert is sent out for a certain location, the phone numbers attached to the addresses for the area receive the same emergency message. Another way is to download the mobile application, which is free as well. 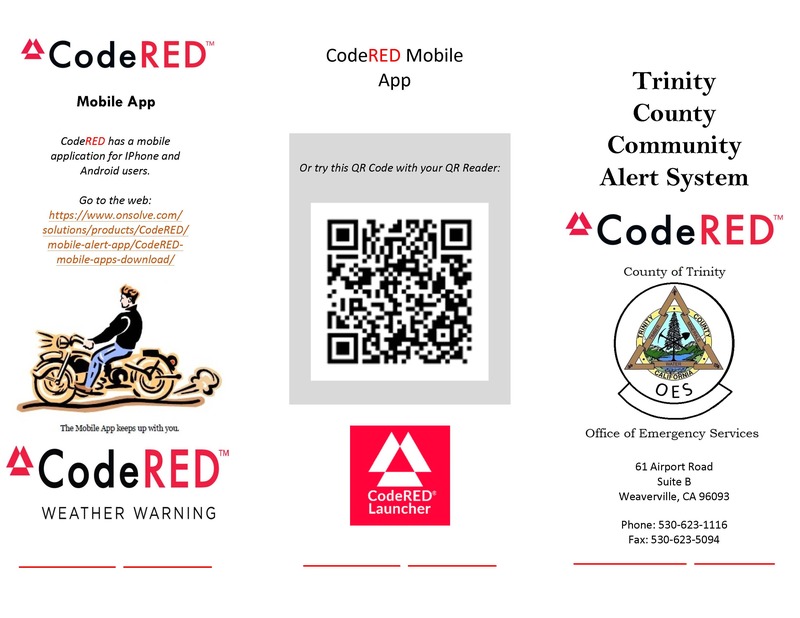 Once the app is installed, the CodeRED system follows your cell phone as you travel to alert you to any emergency notifications sent out by the national network. This way, you are plugged in to receive alerts no matter where you travel. 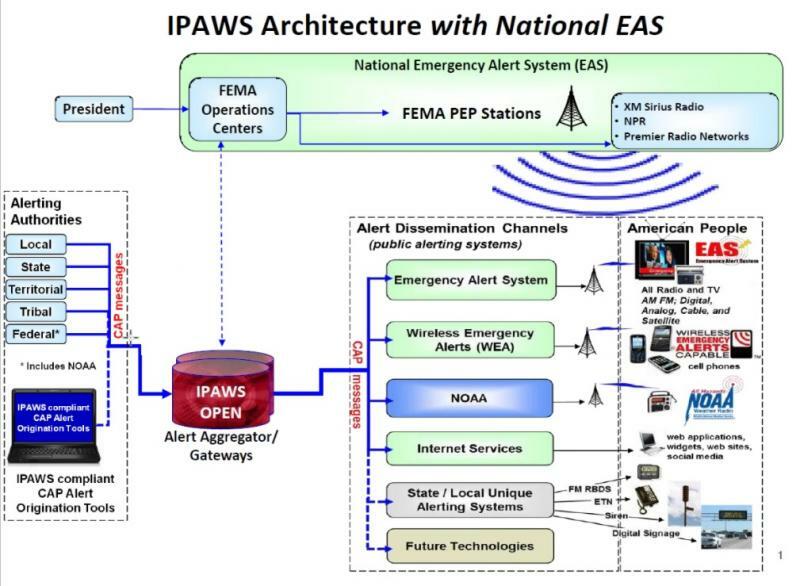 OES is also in the process of being qualified through FEMA to send emergency messages by way of television, radio or cell phone within the Trinity County Operational Area (TCOA) during a time of a disaster (it is the same method as the weekly test scrolling on the television or interrupting a radio broadcast).